TONY BENNETT: There goes our humility. We bring the trophy with us. I’m so thankful that these guys — it’s a good thing to enjoy a moment like this. If you can’t enjoy that, being with this group of guys and seeing their heart, and we weren’t perfect, but we battled, and the regular season and this means a lot. But we know that it comes from the hard work of a lot of people around us. So again, just very thankful just to see some of the plays made. I think when the big guy missed a shot from North Carolina, I said, well, maybe this is a sign here. He had a lay-up and missed it, and you need some of those. But both teams laid it out there, four games in four nights for them, three for us in a row. So as I said, we’re very thankful, and I usually don’t give an opening statement, but I figure after this we can give one. Q. Kyle, would you speak a little bit to the ball security you had? KYLE GUY: Yeah, that’s something we work on every single day. As soon as I got on grounds, that’s something that Coach preached, and it’s always a good feeling when what is normal for us, we do. Q. What does it mean to you to win the ACC championship and particularly in the context of the whole season? DEVON HALL: I think it’s special. I think it speaks to this group and how tough we are. We’ve been battling all season, so to be able to grab this, I think it’s a special, special moment for us. ISAIAH WILKINS: Like Devon said, it’s special, but it means a lot because we do it with guys that we love. This is a family inside of here, so it adds a little extra to it. KYLE GUY: What they said pretty much. Q. Isaiah, Luke may have had 15 in the first half, you guys held him to five in the second. Was there kind of a focus on him to prevent him from getting open looks in the second half? ISAIAH WILKINS: I don’t think it was that. I think he hit a couple tough shots, but I think we just had to clean it up altogether. There were times he got loose and I lost him and things like that in transition, so we just tried to clean that up, and it ended up working out for us. Q. For the players, what did it mean to you guys to have some of your former players, even NBA guys, back here pulling for you and congratulating you after the game? 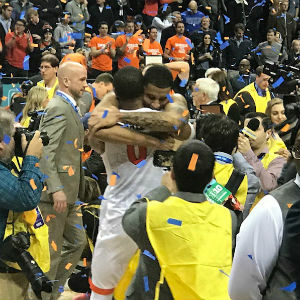 DEVON HALL: It was great because some of those guys have been in this spot, so to have those guys here to support us is great, just to see them cheer us on. KYLE GUY: You know, even someone who didn’t play with any of those guys, it’s very clear that it’s still a family, and they treat me and other guys that didn’t play with them as such, so it’s a good feeling to get a win for people who started this. Q. What does this mean for your city? It’s been through some tough times. What does this championship mean to you city? TONY BENNETT: It means a lot. On the back of our jerseys, there’s a hashtag, #whostogether. And I think a basketball team embodies unity and diversity in a way that’s special. Not uniformity, unity and diversity. And I think it’s the greatest example. And like they said, there’s love here. There’s family, there’s issues we’ve got, but it’s a beautiful thing. It’s funny, I quoted a Psalm 133 before the game, and I said — what it says is it’s a good and precious thing when brothers dwell together in unity. It’s like a fine oil poured upon your head. That’s what I said to them before and that’s what I said after because it’s unity, and that’s what I think sets this team apart. They’re so unified. They’re so unselfish. I don’t mean to give a long answer, but I think it’s an important answer, and I think it’s a blessing to be a part of this. Q. Tomorrow there’s a lot of thought that you guys are going to be named the No. 1 overall seed. Have you thought about the path that you guys want to take? TONY BENNETT: What do you mean? Don’t they put you where you go? I haven’t really thought about it. I mean, obviously — I think we want to go to the John Paul Jones Arena and play there. (Laughter). Q. Some coaches measure programs by Final Fours or different benchmarks. What do you use to measure the program in getting it to where you feel good about? TONY BENNETT: Yeah, I mean, again, I’m so thankful for these guys. To win a regular season ACC, that’s the long haul. That’s big. This is tough. Of course to advance, we went to an Elite 8, almost got to a Final Four, but the NCAA Tournament, you want to do as well as you can in that. Those are the tangible things everybody judges you on. But I heard our former fast break coach said, ask me 20 years from now if we had a successful program and I’ll tell you, and it’ll be in what’s going on here. This is unique, what I’m seeing, and it’s a joy that I haven’t quite experienced as a coach. I’ve experienced a lot of good things and good people, but there’s a lot of good stuff going both ways. But we’ve got to be ready to go when it comes to that. Of course, we want to be as good as we can, but we know, like every coach said, there’s so much parity in this tournament, you get as healthy as you can, as ready as you can. And don’t over complicate it. Improve, prepare well, play to win. That’s what we have to do when we step up. And whoever it is or wherever it is, I don’t know if we have a choice on that or not. Q. Isaiah, obviously you hit two big free throws at the end. Talk about the calmness, if you were feeling calmness at the time, and also, what did you think of De’Andre’s free throws down the stretch? ISAIAH WILKINS: I was just talking to myself, like I do every time when I shoot free throws, and it went in, so that was cool. But yeah, I’m happy for Drey because his wrists are hurting a little bit. So for him to go up there and make most of those is really special. He’s like us, he’s a first year, so that’s pretty cool. Q. It’s a question for the players, a couple of you if you could. The North Carolina players, they sort of describe, even though it’s a tight game, it feels like — even though it’s a two-possession game, it feels like more when they play against you. What do you guys think about the fact that your opponents see narrow margins as bigger because they’re going against you guys? DEVON HALL: I mean, I think that speaks to our defense and how we stand to get back and build a wall. That was key for us with this team, especially with them flying up and down the court. But I think we pretty much thrive on defensive stops, so that gives us energy and it gives us momentum. KYLE GUY: Yeah, you know, before the game, Coach writes on the board, backpack and rebounds, so I like to say put your backpack on and rebound. And when we do those things not give up transition points, and in the pack and rebound, we can feel the energy going our way when we are at our best defensively. Q. Coach, you addressed a bit the long haul versus the tournament, the tournament being crazy and all the parity. I guess my question is it’s the same game you play, whether it’s November or March, same sports and rules, but is there something about play this time of year that kind of changes the dynamics and changes the way you want your team to play? TONY BENNETT: I mean, I think it becomes a possession game. It tightens up. I think defense is really important. Maturity is important. Just being sound — I look at this stat, and I don’t know how accurate this is, but they had three points off turnovers, 12 second chance points but two fast break points. Those are some keys, and we always talk about that. But yeah, you’ve got to take care of the ball. You’ve got to rebound well, and I think to advance in the tournament, and of course you’ve got to not allow people to score, and then guys have to make plays and play with the intangibles, and this team is all about the intangibles. I’ve been fortunate enough to — they showed it and they did it over the long haul in the conference, and then of course it gets tested in this, and it gets tested the next time-out. Q. Devon, after ACC regular season and tournament championship and the school record for wins in a season, what do you do, if anything, to kind of refocus for the NCAA Tournament? DEVON HALL: I mean, I think we still have to room to improve. We’ll go back and find out what mistakes we made during this tournament and then grow from it. Q. Coach, I know you’re not about individual accolades, but I wanted to let you know and get your reflection on it. There are only 12 head coaches who have won more than one of these, so you’re on a list with Mike Krzyzewski, Roy Williams, Dean Smith, Jim Valvano, et cetera. What do you think about as the son of your coach yourself when you see your name on a list like that? TONY BENNETT: Yeah, to me the celebration and the joy comes in that 40 minutes or whatever it is of play, and then honestly stepping back — and watching them enjoy the celebration. That’s the joy. Those things, it’s an honor, and I’m thankful because I’ve had good players. It’s good, but I just — I love the game, and I know those things — they fade. Again, 20 years ask me what kind of relationship we have, what they’re doing. That’s the stuff that’ll last. I know that. Q. Coach, Coach Roy Williams mentioned in the press conference before, he’s been to nine Final Fours, only, I think, won two of these conference championships. What do you feel like winning or not winning a conference championship does for a team heading into the bigger tournament? TONY BENNETT: You want to play your best basketball at the end of the year. As I said, I think they’re both significant, a regular season and this. Where I grew up, that’s just kind of how it was, that long haul. But I think you want to play high level basketball as you head into the end of the year, and you have to do that to be successful here. And again, we’ll get our rest and hopefully be ready to go at the highest level that we can play at. Q. You have no one-and-dones on this team. That’s not to say you don’t have talented players, but do you see yourself as a team that really needs to max out, that needs to be especially disciplined, that really has to sort of maximize the finer points and be almost perfect? ISAIAH WILKINS: You know, I think that we know who we are. I think that’s something that we have to do, so we don’t have a really big room for — a really big margin for error. Like you said, we don’t have any one-and-done guys or anything like that. As older guys, you develop over the years from going to playing, like five minutes my first year to now, and you grow. I’ve grown with Devon over time like that, so I think that’s our way. It’s not going to be questioned or changed, unless you’ve got any plans, Coach. TONY BENNETT: Yeah, our one-and-done, I’ve joked about this is a shot goes up and get a defensive rebound. But I think that’s a great answer. I think every team has to max out, but our way is that, and to see their improvement, I think that was a key in this year. Every guy was challenged to — of course every coach wants them to get stronger in the weight room and go to work on their game, and each guy really went to work on their skill development and their physical improvement, and they all improved, and I think that total improvement lifted this thing up. So they’re serious, and they go after it in the off-season. Q. You mentioned the intangibles being a big part of your team. What are some of the tangible things that this year’s team does better than a lot of your good teams? TONY BENNETT: When you have guys — our leaders, I’ll start with Devon and Isaiah and Jack, who I say they’re almost like they started out as entry level at a company, and now they’ve advanced up to executive level. They’re so clear in how they have to play. They’re so sound. They hold guys accountable, and they just — they’re our backbone defensively, and that matters a lot. And Devon will do it, too. Jack is nicer than those guys. But those guys knowing the way, that’s huge. Coach-led teams can be good, player-led teams have a chance to be really good, and that’s what we have here.